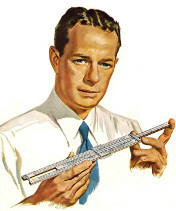 I'm about to sell a very nice 1965 Collins Radio Company Model C19-T Pickett Slide Rule. It has a heavy leather case and four thin plastic reference/instruction cards that fit neatly in a separate pocket of the case. There is normal wear on the case. The slide rule is in very good condition. All the scales are bright and sharp, and the slide moves very smoothly. The Collins Radio Pickett slide rule will be listed with ample pics on eBay. I've looked only recently at eBay's slide rule section and there have been none like it listed for the last several weeks, although the offering of slide rules is extensive. The pics and scans of the instruction cards will be posted here before the C19-T is listed on eBay. This post is to make sure the search engines pick up the slide rule in the event that the eBay listing isn't searchable outside the system, or doesn't reach the results pages before the auction ends. Click [here] to exit this screen. This page was generated in 0.00402 seconds.